At Capital City Academy we aim to help every single student reach their full potential through high quality teaching and learning, stimulating extra-curricular opportunities and a shared commitment to developing global citizens. Every student is recognised as an individual and we cater for each individual’s needs. In line with this, we have developed a statement of intentions for students who have been identified as more able. The aim of the statement is to outline the academy’s endeavours in helping those students develop aspirational ambitions, succeed academically and effectively prepare for successful futures. Please click on the expandable sections below for more information. High prior attaining students are identified based upon KS2 SATs data when entering the academy. This is a national benchmark and students cannot be added to or removed from this list. The Capital Asset Group is a list of the top performing students in each year group based on their Attainment 8 score in all subjects from the three assessment points. This list will comprise no more than 10% of the total year group. The list will be reviewed after each assessment point and students can be added and removed. The rationale behind creating this list was to be able to offer provision for students who arrive at the academy with no prior attainment data as well as to recognise the achievements of students whose KS2 SATs data does not reflect their current levels of attainment. Where the term ‘more able’ is used in this document, it encompasses both of the aforementioned groups. develops an ability to apply new knowledge rather than simply acquire it. Our curriculum is designed to be challenging and demanding from KS3 in order to foster the necessary knowledge and skills for students to attain the highest grades at GCSE level. 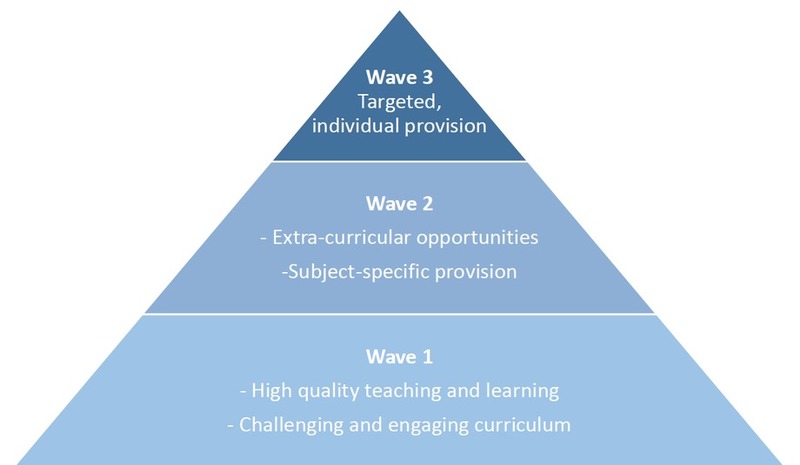 High prior attaining students who are underachieving in a particular subject will be offered additional support by their subject teachers. This may take the form of supplementary resources, specific teaching strategies or additional classes. the Capital Asset Group in the form of trips and events to raise university aspirations (including outreach programmes with Oxford University), trips and events to deepen and stimulate knowledge and other additional opportunities to stretch our highest attaining students. What support is offered to staff? Parents of underachieving high prior attaining students will be involved in a dialogue about how best to support their child. Students know who the More Able Lead Teacher is and can approach them with questions and ideas at any time. Ensure funding is made available where necessary and particularly for those students who are underachieving. Highlight any High Prior Attaining students who are underachieving to their subject teachers for subject-specific intervention. Create Student Intervention Plans for any high prior attaining students who are significantly underachieving. To ensure funding is available for more able initiatives where necessary. More able provision will be monitored and evaluated on a regular basis. The opinions of staff, students and parents regarding more able provision will be sought on a yearly basis at a minimum. All activities and initiatives will be recorded and reflected upon through quantitative and/or qualitative methods. Any activities which incur a cost will be evaluated at the end of the programme. The findings will be presented to the Vice Principal (Inclusion) before proceeding with a further programme. More able students should be leading their own and others’ learning. Students should be facilitating learning through group work and delivering sections of lessons. Students should also be taking a proactive and independent approach to their own learning through self-assessment, self-pacing and self-monitoring. Additionally, outside of lessons, students should be reading around topics, completing additional high-level practice questions and demonstrating an understanding of how individual topics come together as a whole. Extension and challenge work should be of a more demanding and complex nature for more able students. The focus should be on providing work which is more difficult, open-ended and creative- not just more in terms of quantity. Teachers should make extension and challenge work explicit to students and should ensure more able students are completing this on a regular basis. More able students should be exposed to additional material which applies content beyond the subject-specific curriculum. This may take the form of applying knowledge to real-life examples and contemporary issues; integrating work beyond the current key stage; and making interesting and creative cross curricular links to other subjects. More able learners should be encouraged to construct their own ideas rather than passively receive content. Learning for more able pupils should involve a range of critical thinking skills to help students achieve this including: problem solving, high-level analysis, enquiry-based approaches, justification, synthesis, evaluation and critiquing and disproving theories. What do the above strategies look like in different subjects? Integration of additional texts to supplement core texts. Applying current affairs and key historical events to texts. Applying philosophical and ethical questions to texts. Introducing literary theory and criticism. Allowing students to form their own questions to respond to. Allowing students to construct responses in small groups or pairs. Introducing mathematical concepts beyond the curriculum for the year group. Encouraging participation in UKMT Maths challenges that stretch students creative, visual and problem-solving abilities. In geography, students will be given “P5 homework’ in which they must do an extended task such as a poster, presentation or essay, the best of which will be given a P5. Asking students to research the basic facts about a topic at home in order that they can then study it in depth in lessons. Using opening questions at the beginning of topics to enable students to create accounts and reasoned arguments at a relatively abstract or hypothetical level. Encouraging students to identify the successes of others and to celebrate them. Using visually exciting resources, including new technology to promote curiosity. Providing opportunities for students to respond in ways other than writing e.g. display work, role play and short video films. Give a set number of words to be used to make more able students think hard before they write, and make every word count.